Townhouse four at One Morton Square is a rare opportunity to own a stunning and ideally laid out townhouse with all of the benefits and conveniences of a full-service condominium, including doorman and concierge services. 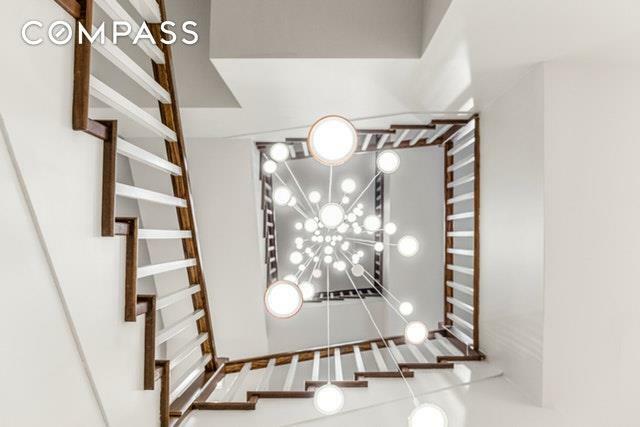 Entered either via private entry from cobblestone Morton Street or via the doorman, the home sprawls across three levels, all serviced by private elevator. 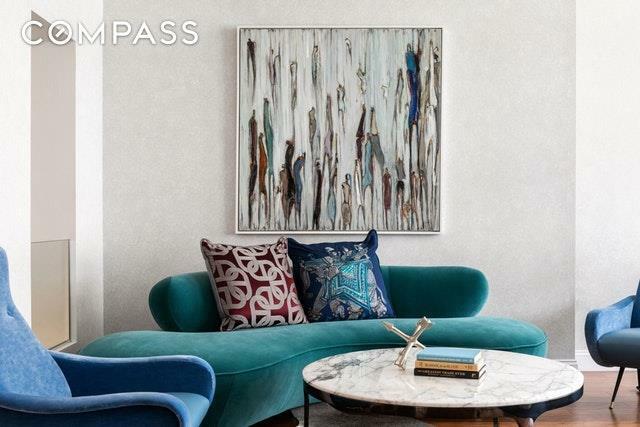 Immediately upon entering the ground floor, you are greeted in the entry gallery by soaring, 15 foot ceilings that define the airiness of the home. On the ground level is a fourth bedroom or den, with a wall of built ins and complete with a full marble bathroom. The current owner has also outfitted a room on the ground level as either a large storage space or staff suite, adding a possible fifth sleeping area to the townhouse.Continue up the open staircase, stunningly outfitted with a custom LED chandelier, to the second floor with continued high ceilings, and an open-plan layout replete with space. On this level is the living room with wood-burning fireplace, a powder room, dining room decorated in Venetian plaster, and chef's kitchen with appliances by Sub Zero, Wolf, and Thermador. There is also a large, 22x15 foot terrace complete with turf and planters, perfect for entertaining!On the top floor, also accessible by private elevator, the home has two neighboring guest or children's bedrooms, each with en-suite baths and large, custom-fitted closets. The master bedroom, which faces south, has four custom walk-in closets, each built out. The master bath is a five-piece, with soaking tub, stall shower, and double vanity, and is clad in limestone. 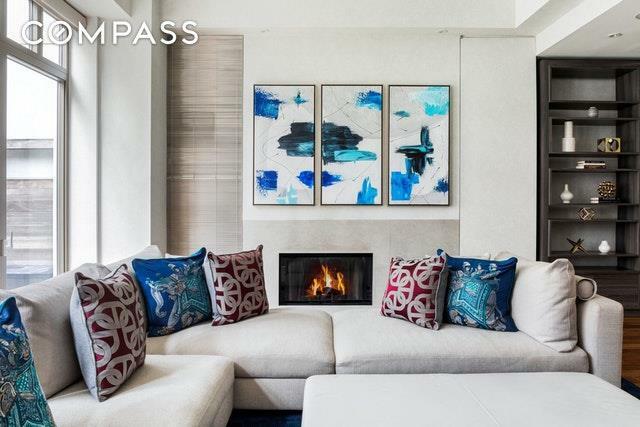 The home is fully outfitted with Smarthome technology, including a full security system, Lutron lighting and shades, Sonos surround sound built-in speakers throughout, and Nest thermostats, all of which can be conveyed to the next owner for ultimate convenience.Located on the Hudson River, One Morton Square is a full-service condominium in the prime West Village, featuring 148 residences designed by Costas Kondylis. Amenities include a 24-hour doorman and concierge, fitness center, children's playroom, and on-site parking garage. There is also a brand new resident's lounge. 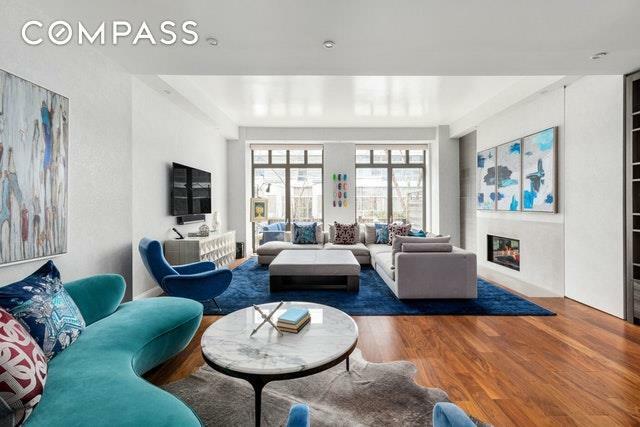 With easy access to the waterfront, Hudson River Greenway, and world-class restaurants and shopping, this stunning home is centrally located in the most in-demand area of the West Village and ready to be offered to its next owner.